Granulators generally have an open rotor configuration which means that air can easily move around the rotor while cooling the product however there are also closed rotor granulators which operate with high speeds. The components are typically ground down to the consistency of corn meal and sometimes even smaller. These grains range from 0.2 and 4.0mm. There are two types of granulation which are wet granulation and dry granulation. Wet granulation causes the granules to be formed when the granulation liquid is pour onto a powder bed and is mixed together through a impeller, screws, or air. The agitation of the two substances creates the wet granules.The most common liquids included are water, ethanol, and isopropanol. Aqueous based solutions are generally much safer to handle than solvent based solutions. Dry granulation is when the granules are formed without the use of a liquid. This process is prefered in situations where the products may be sensitive to moisture and heat. To create these granules without the utilization of moisture will require the use of a compactor. 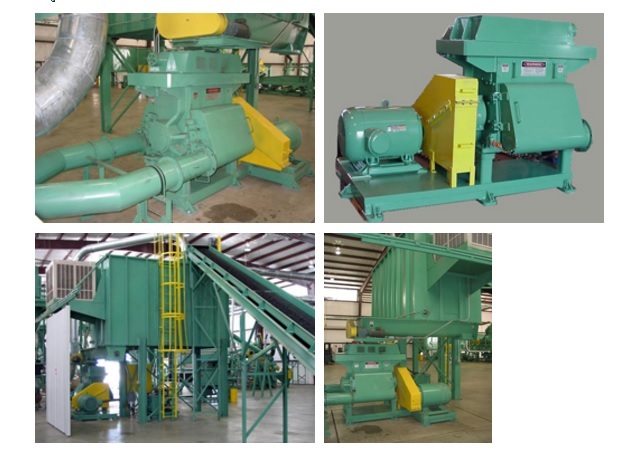 Granulators are very important for various applications involved in the recycling industry. These products are ideal for lighter materials like plastics and rubber as these substances do not grind well. Granulators Granulators are machines that are designed to granulate a substance into a grain. What differentiates granulators from other size reduction machinery such as shredders or grinders is that granulators make large components and make them significantly smaller then what a grinder could do.